Baking cakes puts me in my happy place. I hope the moist, tender crumb of these cupcakes and the bright citrus filling and frosting will put you in a happy place, too. Compensation was provided by Gallo Family Vineyards via Sunday Supper, LLC. The opinions expressed herein are those of the author, and are not indicative of the opinions or positions of Gallo Family Vineyards. For as long as I can remember, I’ve been the family birthday cake baker. Even before I attended culinary school, and even before I realized how much I loved cooking, I baked the birthday cakes, even my own (always boxed yellow cake mix with store-bought chocolate frosting). Even though my mom doesn’t even LIKE cake, she always let me make one, because I enjoyed doing it. And everybody knew my grandmother would complain that there wasn’t cake. Woe to you if you cut her too small a slice. In my tweens and teens, those cakes came from boxed mixes. I can remember my first failure, too. I didn’t follow the instructions to beat the batter for a full 2 minutes. “The ingredients are all mixed together. Why do I need to beat it for 2 whole minutes?” And when I tried to take the baked cake out of the pan, the whole thing fell apart. Being a problem-solver, I wanted to find out why. Beating the cake batter for two minutes builds gluten. Gluten is a protein composite found in wheat (flour) that provides the structure that allows the baked cake to hold its weight (and not fall apart). We didn’t have internet access until my later high school years, so I had to turn to books and magazines for research on cooking. When I went to the library to do research for a school assignment, I spent about half of my time there reading about cooking. As I got older, I started baking from scratch, and in culinary school, I learned that baking is as much science as it is art. There are very precise ratios that go into cakes, cookies, muffins, and pastries. And if you alter the ratio too much, your recipe fails. Ingredients matter, too. If you’re going to use baking soda to leaven your baked good, you’re going to need something acidic in your dough to get it to rise. I love being complimented on my cooking and baking. Outwardly, I deflect compliments by saying ,”Oh, I just followed the recipe,” but inwardly, I’m thrilled. Baking is where I’m confident. Baking is what relaxes me. When I’m stressed out, I bake. My happy place is my kitchen. I love this cake recipe, because the authors were always the first I turned to when I wanted to learn the “why” behind the recipe. Why do we use these particular ingredients? Why are they added in this order? Why do we use this method? Before there was a whole channel on television devoted to cooking and baking, these cooking magazine authors taught me how to bake. I’ve turned their 9-inch layer cake into cupcakes, because I can kid myself, and call it “portion control” (while eating two cupcakes in one sitting). I’ve filled them with a luscious lemon curd filling, and flavored my absolute favorite frosting, Swiss Meringue Buttercream, with the same lemon curd. 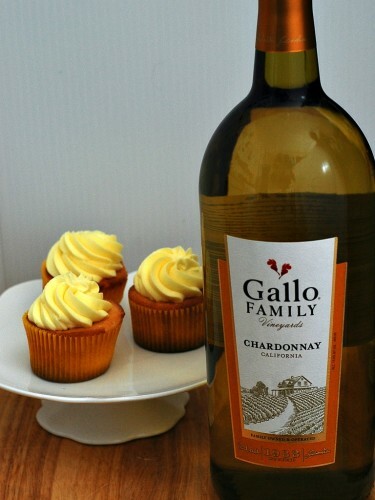 These cupcakes pair beautifully with Gallo Family Vineyard’s Chardonnay. This white wine’s citrus undertones enhance the lemon filling and frosting, while the cupcakes themselves bring out the subtle notes of vanilla in the wine. Make the cupcakes: Set oven racks in upper-middle and lower-middle positions. Heat oven to 350 degrees. Line two 12-cup muffin tins with paper liners. Set aside. Mix cake flour, sugar, baking powder, and salt in bowl of electric mixer at slow speed. Add butter; continue beating at slow speed until mixture resembles moist crumbs. Use a large scoop to portion batter evenly among paper liners. Arrange pans at least 3 inches from the oven walls and 3 inches apart. Bake until thin skewer or toothpick inserted in the center comes out clean, 15 to 18 minutes. Let cupcakes rest in pans for 3 minutes, then remove the cupcakes to a wire rack to cool completely. Once completely cooled, use a ¼-inch round cutter to remove the center of each cupcake (or, use a paring knife to cut a small cone-shaped hole in the center of each cupcake). Place 1-cup lemon curd in a large pastry bag. 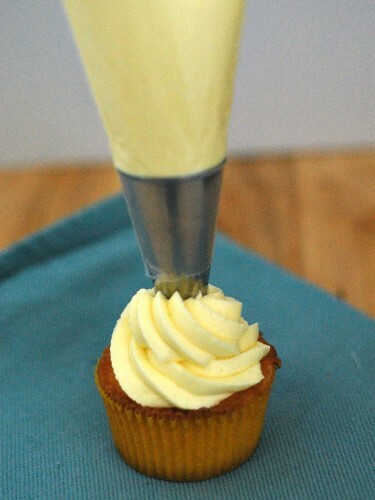 Snip off the tip, and pipe lemon curd into each cupcake. Refrigerate until ready to frost. Make the icing: Place the whites and the sugar in the clean, dry bowl of a stand mixer. Place the mixing bowl over the simmering water (the bottom of the bowl should not sit in the water). Continually whip the egg whites and sugar until heated and the sugar dissolves. Remove bowl from the water and place on the mixer. Whip until meringue forms soft peaks. Switch to the paddle attachment. Add the butter, 1 tbsp at a time, whipping until fully incorporated before adding more. The time it takes to incorporate will get longer and longer as more butter is added. After all the butter is added, add vanilla and lemon curd and continue beating until the buttercream comes together and looks smooth and creamy. Use immediately, or refrigerate until ready to use. If using later, allow buttercream to come to room temperature, then beat again before using. Don’t forget to read the other Sunday Supper/Gallo Meals with Memories stories! Make sure to go visit Gallo to learn more about their wine and read more Meals with Memories stories, as well as some great recipes. While you’re at it, make sure to check out Gallo’s convenient Store Locator! Sunday Supper’s Meals with Memories features two Gallo wines: Chardonnay and Merlot. Now those are some fabulous cupcakes for folks who love all things lemon. My sister is the baker in our family for birthdays – I am the one who makes the meals, lol. 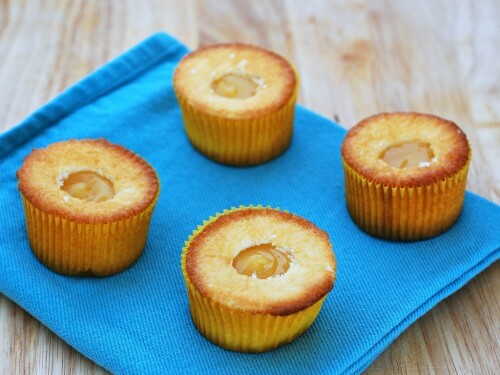 I love everything about the lemony goodness that are these cupcakes! Now these are some spectacular cupcakes! Between the filling and the frosting, who could resist??? These cupcakes look amazing! I seriously need to try lemon curd! mmmm…. I can taste and smell these all the way over here! I love the lemon curd surprise in the center! This recipe looks amazing and the cupcakes are just adorable! You had me at lemon curd! yummm Can’t wait to try this recipe, Coleen. Thanks!! 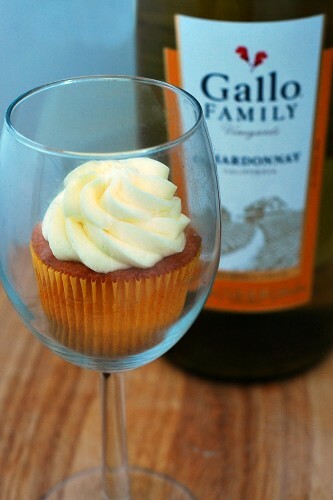 LOVE citrus desserts, and I’m betting the Chardonnay was a perfect partner to these cupcakes! Lemon says my name! So I had to stop and take a gander at these delicious cupcakes! The chardonnay does sound like a wonderful pairing! Thanks for sharing! And, thanks for the tips about the mixing of cake! I learned a lot today! My grandma sounds like yours! And she would probably eat two cupcakes… me too! I just love your story of being the cake baker! I had that happen to me also:) Your recipe is beautiful! I want one right now! YUM!! I am no baker, but these make me want to get into the kitchen and bake!! These look wonderful! Love these! holy yum those look good! I absolutely adore anything with lemon curd in it. 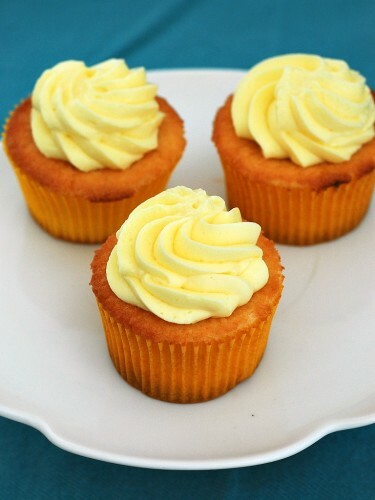 Lemon curd is the best…then put it in cupcakes topped with lemon frosting, and you’ve created the perfect dessert!